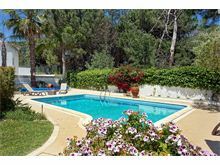 Situated just 200m from the tennis centre, Villa Esmeralda is the perfect choice for those not wanting to be totally reliant on a car during their holiday as golf, tennis, numerous restaurants, boutiques, bars, the beach and even a nightclub are reachable on foot. The light and airy interior of this villa continues throughout with a bright kitchen, modern bathrooms, living room and bedrooms. The pretty garden is surrounded by pine trees and has a covered terrace that will offer plenty of shelter from the midday sun. Open plan sitting/dining room with TV, DVD and doors to the garden, pool and barbecue at the rear of the house. Kitchen with microwave, washing machine and dishwasher, 1 air conditioned twin bedroom with en suite bathroom and doors to the garden. Upstairs are two air conditioned twin bedrooms, each with a shower room en suite. Maid service 2 times per week. Pool towels are not provided. WiFi and pool heating are available at additional cost, if required. Overall pleased with the villa and good service from the on site management company. Villa Esmeralda was in a great location. 5 mins car ride from the sea, restaurants, tennis, teenage nightclub etc. Yet it was on one side surrounded by woodland and despite being at the end of a terrace of villas, it felt private and was always very quiet. The rooms were very comfortable and fresh new bathrooms and kitchen. The outside was very pretty and well maintained and the pool size was generous for the outdoor space. A great base for a holiday! Villa Esmeralda is a lovely villa set at the end of a cul de sac. Peaceful and quiet we enjoyed our stay immensely. The pool was a good size and the rooms large and airy, especially the main room with balcony. We found the kitchen provided all the crockery and utensils we needed and the barbecue, which we took full advantage of, gave us that extra, al fresco relaxation we sought when booking the holiday. Highly recommended property for adults and children alike. We returned to this villa after a 6 year break. We found the service was excellent as ever and very responsive. Particularly liked the travel pack and would not hesitate to recommend Affinity Villas to anyone. Will be re-booking next year. 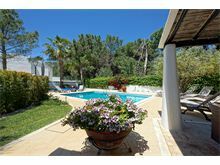 A lovely homely villa with a well sized garden and pool. The three double/twin bedrooms and three bathrooms are all spacious and hence ideal for a large family. The lounge is of a good size and the kitchen has everything you need. 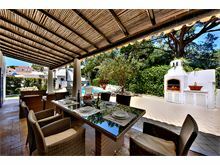 Near the tennis centre, the villa is 1.6km from the lively and fun Praca by the beach. 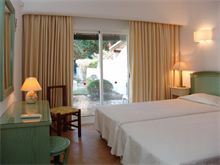 Vale Do Lobo is beautiful and incredibly well kept, The Praca has a number of restaurants and a lovely unspoilt beach. Everything is high quality, feels very safe. It is a great base for the visits to the many wonderful beaches and towns in the Algarve. The villa was excellent. 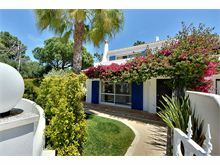 We had friends who have visited Vale do Lobo for many years and they'll all been in contact with Affinity to book the same or another villa for forthcoming years. Really first class services. Many thanks for making my first family holiday to Portugal so memorable. Great location for golf or tennis lovers. Excellent villa and true to images shown on website. 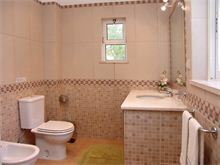 Very clean and excellent kitchen facilities; extremely well thought out and stocked. Very clean and added bonus of plenty of towels in the bathrooms. A super villa, lovely pool and gardens. Great holiday. 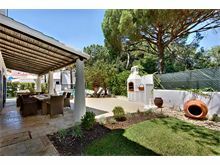 This is a very nice villa in a quiet location on the very edge of the Vale de Lobo resort. The beach is very good. Supermarket and beach areas are accessible on foot but they are about a mile away. There is plenty to do along the Algarve and you don't have to pay a lot to eat if you avoid the resort. Overall a very good holiday. Affinity also provide a great and friendly service. Loved the location and the villa is nice. Swimming pool great size and if you like playing tennis, minutes walk from the Tennis Academy.